Education about mental health and wellness is a key focus of the Crazy for Walking initiative. In 2017 mental health speakers visited different towns along the route to shatter myths about mental illness and to highlight the struggles faced by those with mental health challenges as well as their hope for recovery and resilience. This year we will have even more public talks throughout South Africa. See list of schedules below of public talks in your region. Over many years, positive psychology has promoted the benefits of a positive mind set for improved mental health and wellbeing. It is one of the pillars of Vista Clinic’s Happiness HELPS campaign, developed to improve positive affect in patients. 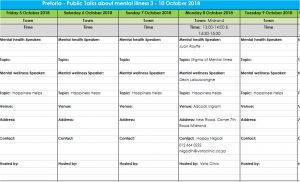 The aim of the campaign is to promote mental wellness and to reduce the symptoms of depression. The Happiness HELPS concept consists of a set of practical daily actions to combat the negative emotional impact of depression and anxiety.